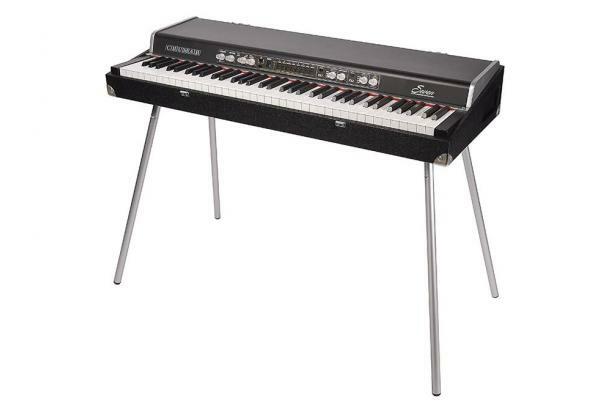 The Crumar Seven is not just another digital piano, it's a whole new thing with an old look. As you can see, it is built into a wooden carrying case and has a shape that is reminiscent of some of the most famous electric pianos of the early seventies. This kind of design was almost obligatory back in the day, it was practical for both the user to transport and for the manufacturer to assemble, and was necessary to hold a very heavy structure made of several big moving mechanical parts. At some point, when digital electronics took over on old mechanical and analog keyboards, the concept of portable piano has gradually changed making the instruments smaller and lighter, up to the point that some of the modern digital pianos are small enough to be carried in a bag. But do they look good on a stage? Do they feel classy, solid, comfortable like an old electric piano did? And what about the sound? Almost all digital pianos offer just basic piano sounds based primarily on sampled material, and all of them aim to replace a grand piano, leaving behind the sounds of famous electric pianos, treating them as just an extra with less importance. But now there's the Crumar Seven. The latest technology in sound generation under the form and the look that all keyboard players love. Crumar Seven's main focus is the electric piano, the most important electric piano sounds that have made the history of the music of the past decades. All sounds are based on real-time synthesis models, various types of synthesis specifically engineered to thoroughly reproduce a particular type of sound. And naturally there's a physical model of a grand piano, too, for a total of nine different synthesis engines. Portable, elegant, lightweight, one of the most revolutionary stage pianos of the modern day, complete with carrying case, metal legs and accessories, the Crumar Seven works like a digital instrument but feels like an analog, electro-acoustic instrument and redefines the concept of the Stage Piano.